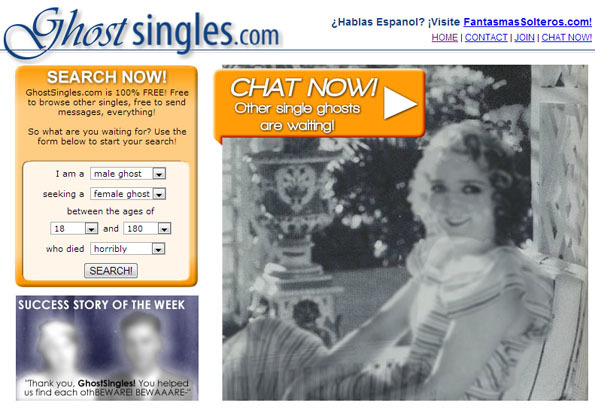 Ghost Singles is a dating website for the deceased. It’s super romantic and by romantic I of course mean depressing. There are plenty of dead dates to choose from like the ghastly Phantom4u, the 100 year old Stage 5 Clinger, Wraithyguy, and the clearly hopeless Lonely4ever. All you have to do is enter your personal stats and choose your preferences and presto! You’re on your way to a completely fulfilling relationship with a dead person. Because the spirit clanging chains in my attic needs love too! Annnnd a new place to stay. Seriously bro, you give me the creeps! Be sure to head over to GhostSingles.com to meet the love of your (after) life!